Coherent Design and AVI Systems equip new 200,000-square-foot venue with Kara and Kiva II line arrays along with the new P1 AVB processor. The new 200,000-square-foot Texas Live! entertainment complex offers dining, live music, and other entertainment options—and, next year, the first Live! by Loews boutique hotel. 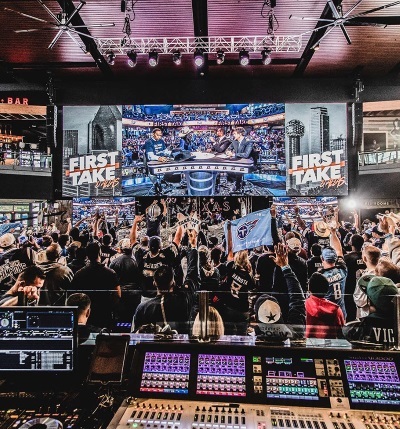 Backed by the Texas Rangers and City of Arlington, among others, the vast $250M complex recently celebrated its grand opening with L-Acoustics Kara and Kiva II systems in two of its primary performance spaces networked via AVB and processed by the Lone Star State’s very first installed P1 digital audio processor. The performance venues include a 5,000-capacity outdoor event pavilion known as Arlington Backyard, and the Live! 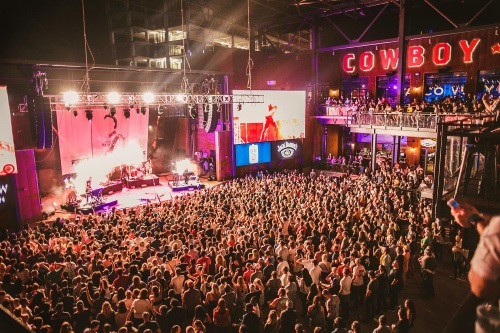 Arena, a 35,000-square-foot, two-level concert and festival space featuring a gourmet burger restaurant owned by Dallas Cowboys icon Troy Aikman. Both venues now sport L-Acoustics systems specified and designed by Las Vegas-based consultant Coherent Design, and installed and integrated by AVI Systems’ Dallas team. Arlington Backyard’s system comprises 24 Kara enclosures split between two hangs on either side of the stage, each backed by five flown SB18m subs. Additionally, four coaxial X12 enclosures serve as side fills, while six X8 are used as front fill. Everything is powered by 11 LA4X amplified controllers. Live! Arena, described as the “living room” of Texas Live!, is home to 16 compact Kiva II enclosures flown eight per side with three SB15 subs atop each hang. These are buttressed by four ground-stacked KS28 subs in end-fire mode, plus eight X8 as fills, all powered by three LA12X and two LA4X amplified controllers. Furthermore, both venues also utilize L-Acoustics’ new AVB-compliant P1 networked digital audio processor, which combines an EQ station with delay and dynamics processing, and a multi-mic acoustic measurement platform with offline delay finder and EQ modelization. For Arlington Backyard, the Kara loudspeakers put plenty of energy into the room and fulfilled another stipulation by the owners, who wanted a rider-friendly brand in the house to minimize the amount of system movement as different artists passed through. However, the designers also had to be wary of LFE control. The new Live! by Loews boutique hotel would be built along one of the venue’s walls, and noise containment from the venue with respect to the hotel property was a priority. That was managed by arranging the ten SB18m subs in a custom cardioid array. “It really does confine the energy without diminishing the impact in the venue,” he says. Biamp Tesira DSP serves as the campus-wide network backbone, which includes LA12X and LA4X networked using AVB protocol throughout the eight venues that comprise Texas Live! Van Stipdonk also points out that the interoperability between the LA12X, LA4X, P1, and Biamp Tesira allows music performed at either of the venues to also be routed to any of the other seven locations in Texas Live!, as well as to the plaza surrounding it.